We have had a fantastic summer this year and since I had some left over yarn i white, lilac and pink cotton I wanted to use this yarn for more summer clothes for your doll. Therefore I have knitted 2 similar dresses. One dress is knitted in pink. The other one is knitted in white. I like to see how different the same dresses can be when they are knitted in different colors. I have called this pattern Tuppen and Lillemor after a cute little song for kids from my childhood. When they went their own way, for the first time. Hour by hour went - not a word. Lillemor cannot do it anymore. Tuppen! I regret that you know. Let's be friends forever and ever. Come and join us in our yard! Do not be angry with me anymore! while the others stand and see. You can climb in our trees. Because I'm so fond of you! 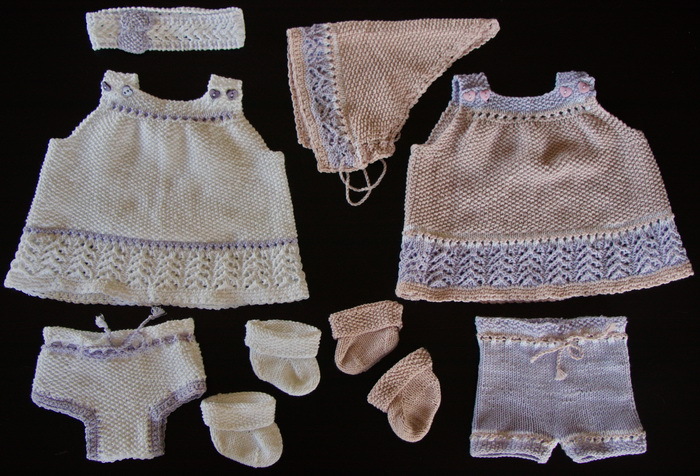 The pink dress has a pattern in lilac knitted before knitting the dress in pink. 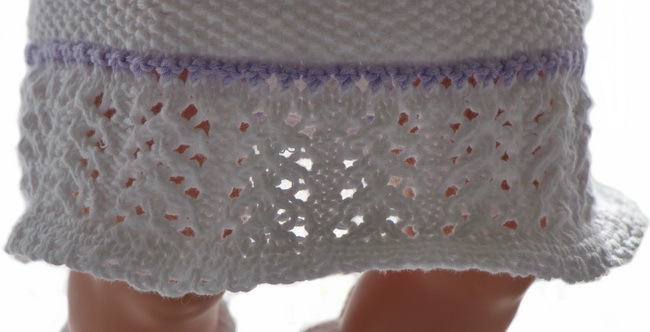 The white dress is mostly knitted in white with only very small borders in lilac. ... for warm summer days. As for accessories to the pink dress, I knitted a pink headscarf with the same pattern in lilac as the pattern for the dress. Lastly, I crocheted edges around all sides like edges for the dresses. This is a perfect headscarf for the pink dress. Text : For the white dress I knitted a hairband in white. The hairband has edges knitted in garter edges and pattern over the 5 center sts. I knitted a little lilac bow in moss sts and sewed on the hairband over the seam. I thought the bow looked cute. The accessories for the dresses are different for each dress. 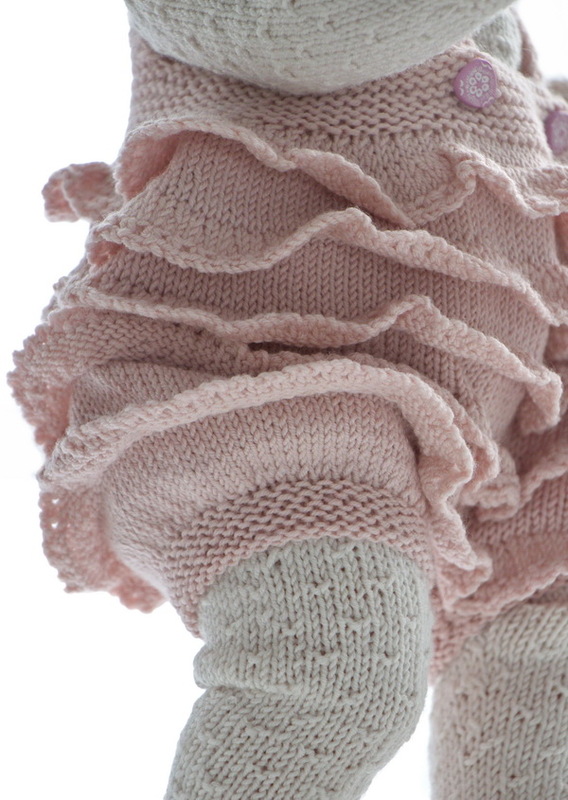 For the pink dress the pants are knitted in lilac with edges in pink and white. The pants were a perfect addition to the pink dress. For the white dress I knitted white pants in moss sts. The pants have lilac crocheted edges around the legs, and a lilac chord pulled through the eyelets. ... one pair of socks in pink. ... in these lovely summer clothes.